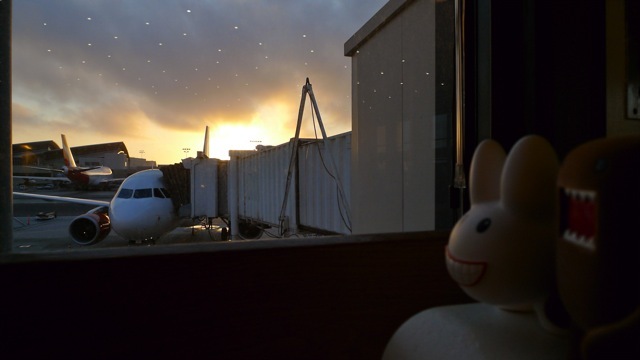 Pipkin had a bit of tummy trouble while flying from BOS to LAX, but he's back to all smiles now that he's had a long layover at LAX. Their last leg is a short flight from LAX to SEA, but it feels like it's been a long day. They got going this morning as the sun was rising on the east coast, and now that the sun's going down on the west coast, they realized they still have a way to go. On the plane again, Pipkin felt well enough to finally get something to eat. They ordered the protein pack, which was surprisingly filled with good snacks! 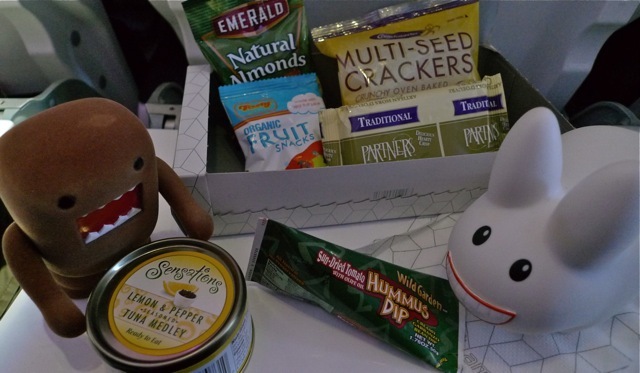 There was tuna (for Domo), hummus, almonds and two different kinds of crackers. Best of all, they finished it off with some vegan gummy fruit candies. Yumyum! Now, for some shut eye. See you in Seattle! Tri Fever, It Never Stops!